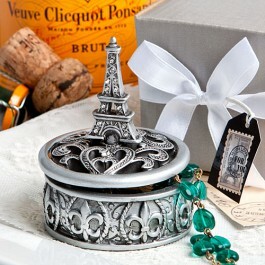 Oh la la this pretty Parisian favor is a real showstopper. And, it’s not only ultra romantic and chic, it’s destined to find a place of honor in your guests homes when they take them home. We know that it’s always fun to add some French flair to an occasion. And, what could be more distinctively French and exceptionally dreamy than the Eiffel Tower?